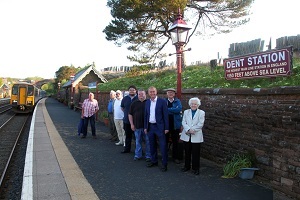 A group including Tim Farron MP, newly-elected District Councillor Ian Mitchell and other members of the Parish Council welcomed the new early morning trains stopping at Dent Station. On a beautiful cloudless spring morning in Dentdale the group gathered on the northbound platform to greet the new 6.47am service from Dent to Carlisle. Crossing to the southbound platform it was only a short wait for the 7.05am service to Leeds. 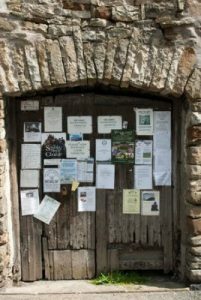 With much of the national media focussing on the problems faced with the introduction of new timetables in many parts of the country, it was a good news day for Dentdale. The new services offer the opportunity to be in Carlisle for a few minutes past 8am and in Leeds by just after 8.30am. Both trains will run Monday to Friday. The times for services have changed on all days, so remember to consult timetables when planning your journey.